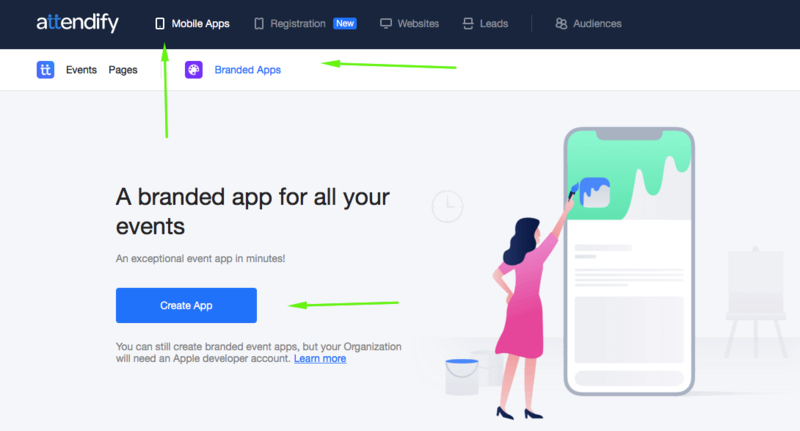 Learn how to create an exceptional, branded One- or Multi-Event app by going through a simple five-step process. Read this article that outlines the five easy steps to building an app. To get started go to the Apps->Branded Apps section of your dashboard and click the "+ Create App" button. On the pop-up window, select the One Event app option. 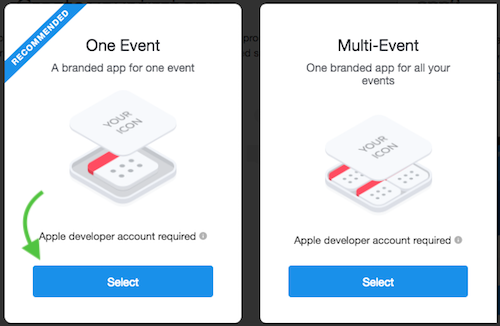 You can create multiple event apps in your account, invite other team members to collaborate, and preview the final look instantly - before making any payments. Customize the App's appearance and choose the variations you prefer in the "Appearance" section. 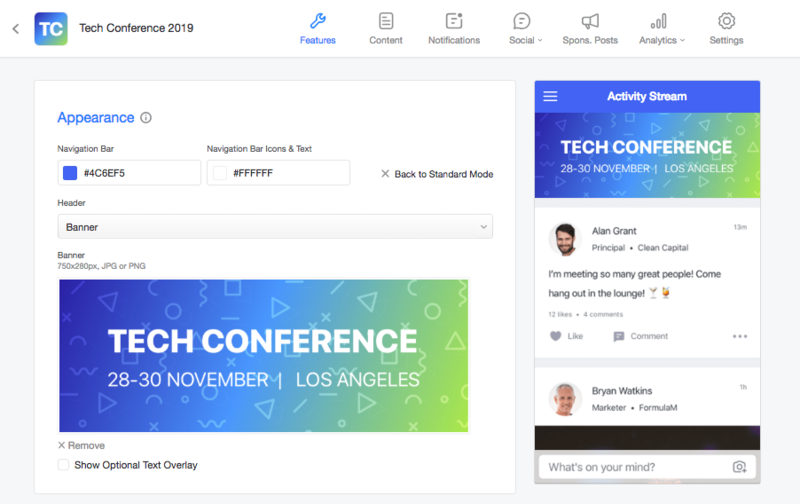 Drag and drop "Features" (Speakers, Schedule, Sponsors, etc.) 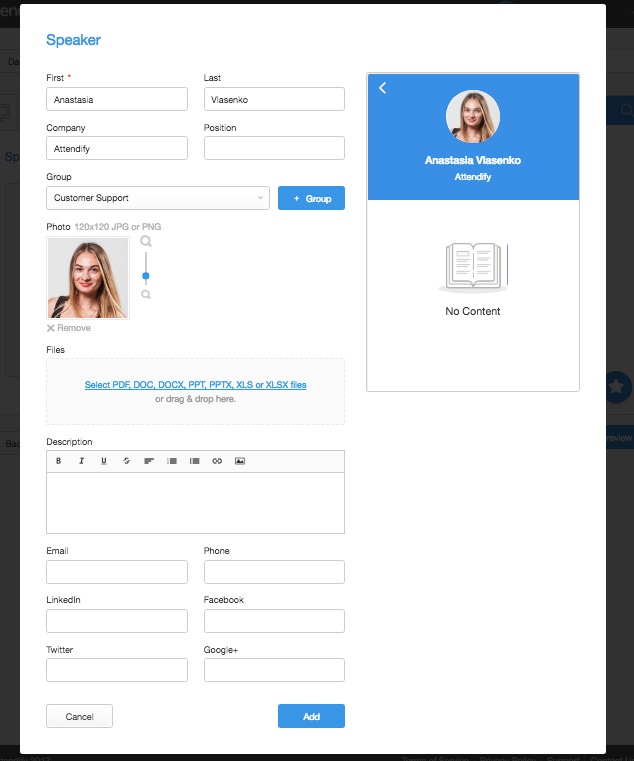 to create your menu (they can be renamed and adapted to include any type of content). You'll be able to modify the menu (add or delete items) instantly, even once your app is live - so don't sweat it! Click "Next" to proceed to the "Content" step. 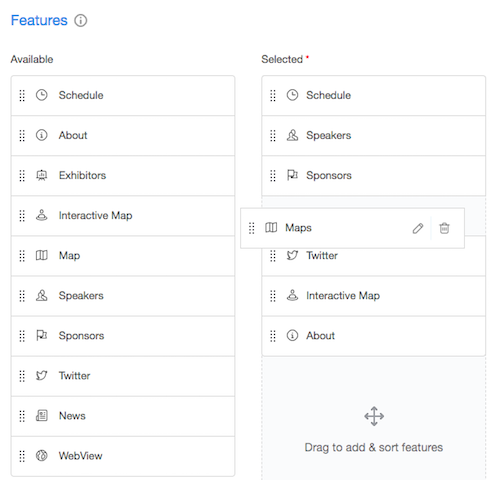 You can upload content in bulk using our easy templates or add items one-by-one (lists of sponsors, speakers, etc). Don't worry about finalizing all content - you'll be able to edit it at any time, even once your app is published. On the "Settings" step include your app description that will be visible on the App Store & Google Play - it needs to be at least 2-3 sentences long. Provide a short and simple icon label similar to the app name (e.g. 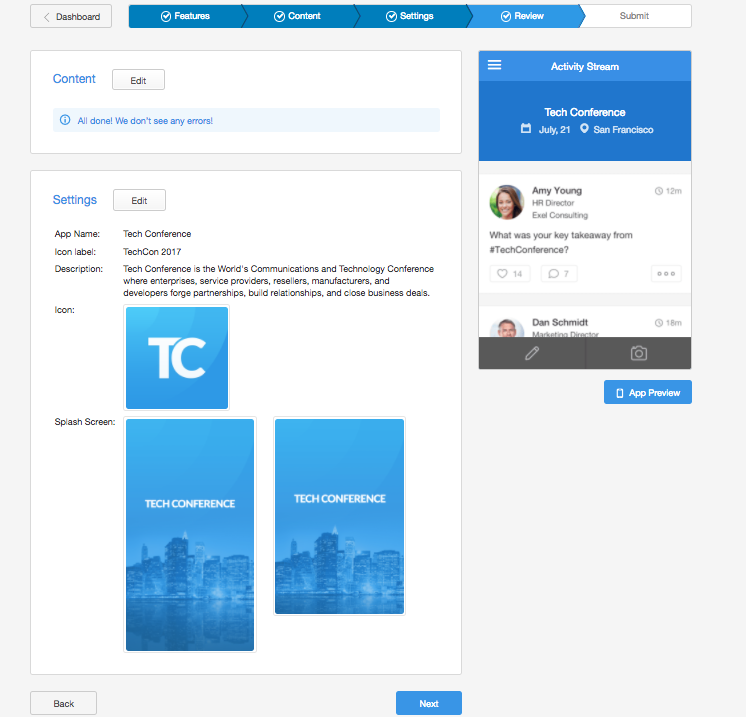 : TechConf) and upload the app icon - it will be seen on user's devices (make sure it's at least 1024x1024 pixels, the edges of the Icon will be rounded off automatically). Upload optional splash screens that will be shown for a few seconds while your app is loading. 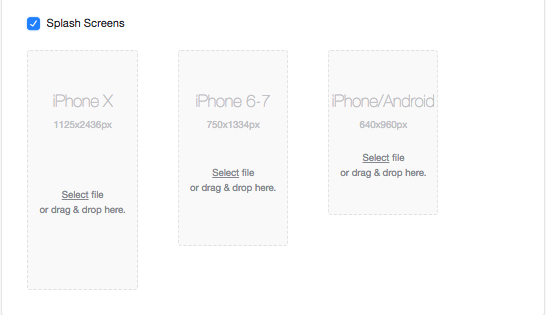 The three splash screen sizes will accommodate all types of devices. You may also restrict access to the app based on the attendee email addresses. 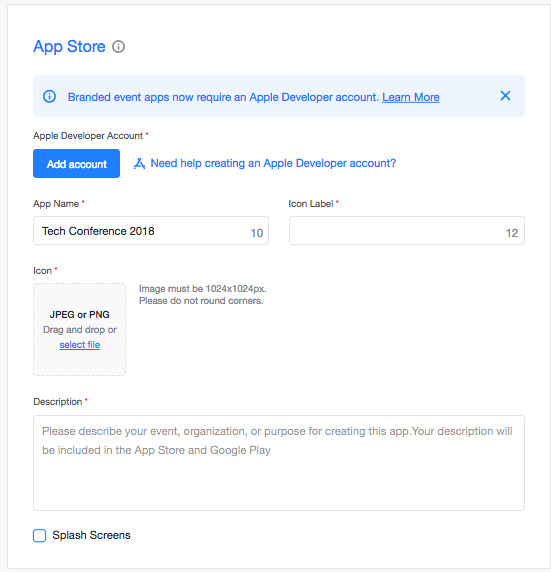 You'll be able to upload a list of attendees after the app is submitted. You will also need to add information for your Apple Developer account, you can see more steps on how to do that here. Double-check any missing items on the "Review" step and continue to the "Submit" step once you're ready to launch your app. Fill out your billing information and submit your app with a single click - the publication process from this point on is 2-3 weeks. We'll send you a notification as soon as your app is live! 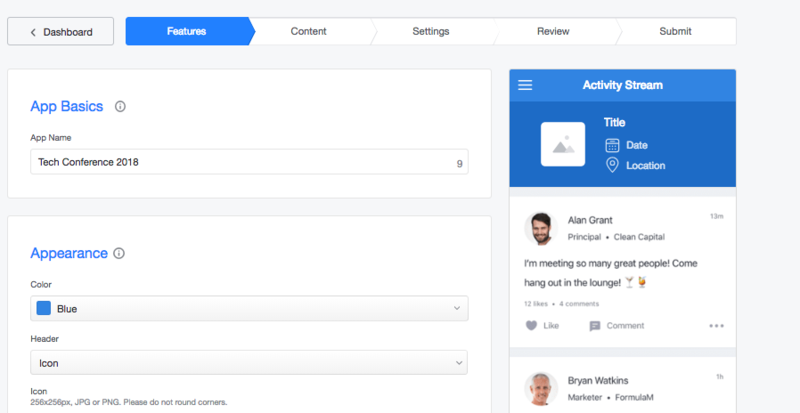 As soon as your app is submitted, you'll see additional features revealed in your account - they will be fully active once your app is published. You can continue building out your app while it's in review and after it's published - so there's no waiting time.